Webb & Co. Return to the Capitol Arts Theater for WW-VI! It’s getting time once again for the Fall Classic from Bowling Green Kentucky….Webb Fest VI. Kentucky is the land of Fast Women, Pretty Horses, The Corvette Museum and now: The Pilgrimage of Webb Wilder’s Loving Public. 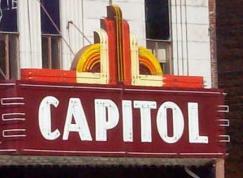 It will be held once again at the Capitol Arts Theater at 416 Main Street, Bowling Green, KY, 42101-2281. We will again be partnering with WDNS Radio and Bryan Locke, DJ Extraordinaire! The show will start promptly at 8pm. Our tickets will get you in at 6pm for the drawings, commingling etc. The general public gets in at 7:30pm. Tickets this year will be Ten Dollars ($10.00) each. We get the 250 seats down front and center at the theater, so get your tickets early to ensure that you get these premium seats. Email Tater Bodine at WebbFanFest2011@WebbWilder.com. Tater will instruct you from there. There will be special SWAG items commemorating the event as well as CDs, DVDs, Shirts and Other Apparel, Posters, Picks and who knows what on sale for your memorabiliating perusal. As usual, we will have door prizes, raffle tickets for a fine Guitar, and 50/50 drawings. This is our 6th year and we are getting better every year. It is my humble opinion that Webb and the Beatnecks put on their very best show for us at this venue, so don’t miss it. Baymont Inn & Suites is offering Webb Fest Six attendees rooms at $67 per night, while their remaining available rooms last. Rooms are available with one king bed, or two full beds. and ask for the Webb Fest Six guest rate. Available rooms are limited, so call now! Red Roof Inn of Bowling Green is a backup, offering rooms at $60 per night (plus taxes). When you call, you may have to request the Webb Fest rate. We don't know the number or sizes of the beds, so if that's important to you, you might want to ask about that also. THANK YOU and we'll see you at Webb Fest SIX! !